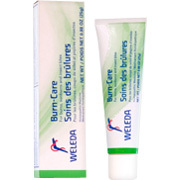 A soothing, cooling gel, Weleda's Burn Care offers treatment of minor household burns, sunburn, and insect bites. Apply to affected area 3-4 times daily. Warnings: For external use only. Stop use and ask a doctor if: condition worsens or persists more than 7 days; accidental ingestion occurs. Avoid contact with eyes. Keep this and all medicine out of the reach of children. For serious burns, seek medical attention. Active Ingredients: Arnica montana extract MT (M) 0.125g, Urtica urens MT (M) 2.375g. Inactive Ingredients: Alcohol, Algin, Glycerin, Water. Burn-Care is shipped in a discrete, unmarked package. Orders are processed immediately and usually take about 3 to 5 working days to be received. We do ask that you try it for 2 to 3 weeks to feel the full effects. Any information received is used only for order processing and shipping purposes. Your information, such as e-mail address, will never be disclosed to a third party.